Norman (Kodi Smit-McPhee – Let Me In) is just your average kid – he likes to watch old movies, he loves horror and he keeps himself to himself. Oh, and he talks to ghosts… something which has his sceptical parents very worried. Norman just wants a quiet life but when a strange curse threatens to destroy his town, Norman is forced to challenge his fears and use his gift to save the day. With a new best friend by his side named Neil (Tucker Albrizzi – Alvin and the Chipmunks: Chipwrecked) and some unlikely help in the form of their respective siblings, Norman and Neil march on to save the town from the dreaded curse once and for all. ParaNorman arrived just before Hotel Transylvania and Frankenweenie hit the big screen. Kids were spoilt for choice with the Halloween market embracing these 3 family animations in 2012. Having arrived in cinemas before those films helped ParaNorman considerably as it attracted the tail end of the summer season without much competition. 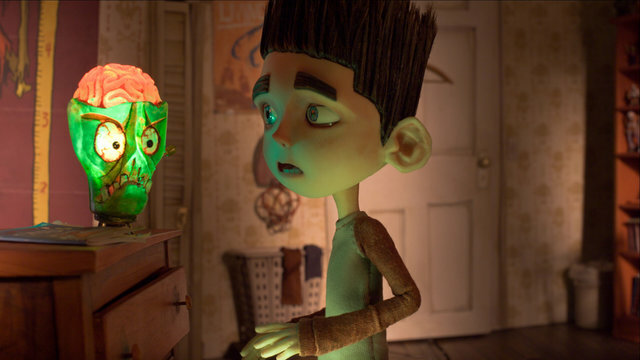 That’s not to say ParaNorman isn’t a worthy film in its own right – the Claymation movie has a lot of style and substance with colourful settings and a neatly observed homage’s to a by-gone era of horror that’s very well realised. It looks sumptuous and has plenty of humour and scares to satisfy most. It starts off very well and sets the scene perfectly with a clever twist that is expertly played out through Norman chatting to his Grandmother. But after such a bright opening it falls victim to a messy middle act that doesn’t know how best to proceed. ParaNorman gets its creativity from the minds that brought us Coraline. If you’ve seen that you will be familiar with the dark undertones of their projects. It may be too much for your littlest kids but for those willing to take a scare or two, ParaNorman delivers a thrilling and adventurous ride that thankfully doesn’t talk down to its audience. Lending their voice to this impressive story is a cast of well-established performers who all bring their A-game to the table. Let Me In’s Kodi Smit-McPhee does exceptionally well as Norman whilst Twilight’s Anna Kendrick steals her scenes as Norman’s sister Courtney. Tucker Albrizzi is hilarious as the sweet but dim Neil whilst Casey Affleck, Christopher Mintz-Plasse, Leslie Mann, Jeff Garlin and Elaine Stritch all play their parts with the right amount of gusto. This is a movie that has a lot of love for classic horror and it shows in every frame. From the well observed scenery to the little, blink-and-you’ll-miss-them background objects like Norman’s alarm clock, there is something to please older audiences who’ve grown up with the likes of Frankenstein and Dracula. There is also a very clever use of the Halloween theme-tune as Norman’s ringtone and a very funny visual gag that pays homage to Friday the 13th’s Jason Voorhees. After a strong opening the film does lose its way but a delightfully offbeat and scary finale helps paper over the cracks. ParaNorman is a fun film for the family but be warned that this is a bit scary for very young kids. For everyone else, it’s a heartfelt and clever tale of scary shenanigans that hits almost all of its marks.